Opinion: UVM: At What Cost STEM? "We're here to celebrate the start of a new era at the University of Vermont," crowed UVM president Tom Sullivan at the May 15 groundbreaking of the Science, Technology, Engineering and Mathematics — aka STEM — Complex. At 266,000 square feet, and a cost of $104 million, it is the largest capital project in the university's history. Emblematic of that new era, in 2013 Sullivan appointed David V. Rosowsky, dean of the Rensselaer Polytechnic Institute School of Engineering, as provost, senior vice president and STEM cheerleading captain. Rosowsky's pitch to the trustees sounded as much like Silicon Valley startup to venture capitalist as bureaucrat to fiduciary. "Imagine teaching and learning spaces without walls, without barriers, and without limits," he wrote. "An icon and an integrator. A beacon attracting and inspiring students from across the University and across Vermont to learn, explore, and discover." The STEM Complex would be more than inspiring, Rosowsky suggested. It was a strategic and a financial "imperative" — not just "to attract top students and prepare [them] for some of the nation's best-paying jobs in some of the fastest growing industry sectors," but also to offer "a demonstrable return on investment." At the groundbreaking, Gov. Peter Shumlin chimed in: "Time and time again, employers say to me, 'If you can just find us more students who graduate with STEM skills, we have a bright future as job creators.'" In his 2013 inaugural address, Shumlin had declared that Vermont's economy was banking on STEM, too. "Success in the new economy depends on an educated workforce with skills beyond high school in science, computer technology, engineering and math," he declared, introducing the Vermont Strong Scholars Program. The scholarship will forgive student loans on final-year tuition at a public institution provided that the student gets a STEM degree and finds a job using those skills in Vermont. Even if the governor's claim were the whole truth — which it isn't — it doesn't have to be. States and universities do not just respond to economic and social reality. They help shape it. Academe makes choices. And those choices express values. President Obama expressed these now-dominant values to a Wisconsin audience in 2014, touting his own STEM-heavy vision of education: "I promise you," he said, "folks can make a lot more potentially with skilled manufacturing or the trades than they might with an art history degree." He added that he had nothing against art history, even liked it. But the message was clear: Art history — or art or history, sociology or anthropology — is a luxury Americans can no longer afford in a cutthroat global economy. And money matters more than anything, more than meaning, culture or pleasure. The attitude is deeply American in two ways. It's utilitarian and it's anti-intellectual. In America, creating, investigating — thinking — with no particular GDP-boosting goal is suspect as effete and self-indulgent, possibly even traitorous. "How do we understand what a university is, and is for?" asked UVM history professor Felicia Kornbluh, director of gender, sexuality and women's studies and delegate to the faculty union, in a commentary last year. Faculty members' and administrators' answers were miles apart, she said. While the former "view their students as citizens whose attendance at college offers access to critical thinking skills that allow them to participate fully in the wider world," she wrote, "elite administrators have repeatedly expressed their sense that students are a source of financial resources for the institution." Kornbluh was referring in part to UVM's year-old incentive-based budgeting, or IBB, which turns each school or college into a "responsibility center," an entity "primarily defined by [its] revenue-generating capability." Rosowsky's report to Sullivan touts those financial incentives as goads to academic excellence and sensitivity to students' needs — as if faculty were not already motivated, as educators, to provide these things. But in reality, IBB — versions of which are being adopted by universities across the country — is more stick than carrot. While there is some sharing from a general pot, IBB requires academic programs to employ "innovation and entrepreneurship" to boost their input of tuition-paying units and their output of degree-holding units, while achieving maximum efficiencies. If the department is overstocked with slow-moving products (er, academic specialties and teachers) attracting insufficient consumer (I mean student) demand, its irresponsibility will be punished in the next budgeting cycle. Among next year's discontinued items is Brenda Beaudette-Kaim, a French lecturer whom students described on the website Rate My Professors as "superb," "awesome" and "absolutely wonderful." "Everything we do is valuable, and everything is there for a reason," Antonio Cepeda-Benito, dean of the College of Arts and Sciences, told the Vermont Cynic, a student paper. "But then you put a price to it. Then you have the value against the cost." At the University of North Carolina, which slashed 46 "low-productivity" programs, including women's and gender studies and Africana Studies, a board of governors member was more succinct. "We're capitalists," he explained to a student newspaper. And capitalism is governed by supply and demand. 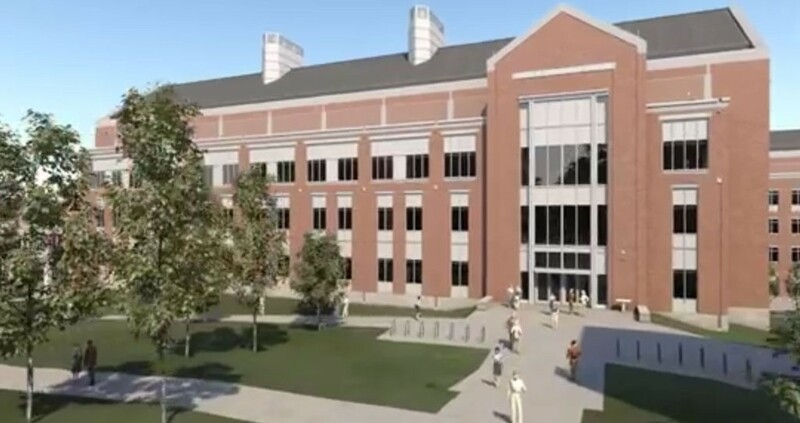 This winter, UVM's board of trustees approved a bond for $78 million for the STEM Complex, increasing the institution's debt level by 20 percent. The university will fund the remaining $26 million with money on hand, in hopes of recovering it from private sources; about two-thirds of that amount is now committed. Administrators talk about STEM enriching the whole university's academics. But don't expect that enrichment to be literal. "Some people might say we have room" to take on more debt, said Budget, Finance and Investment Committee chair David Daigle to VTDigger.org. But, he added, "my own view is, we really don't after we've done this." Daigle called STEM the university's "highest strategic priority." It looks more like the only priority. Montpelier is not rushing to the rescue. So paltry is the state's contribution to its colleges and universities that a 50 percent increase in the appropriation would lift Vermont's national ranking from 49 to only 47. And while other states have begun spending more as the economy recovers, the legislature is still cutting higher education: Funding is down 15 percent since 2008, while tuition has risen more than 20 percent, according to the Center on Budget and Policy Priorities in Washington, D.C. The result of public neglect is increased dependence on corporate support, with strings attached. Will that funding flow to STEM's patent-promising genetics lab? Or to Romance languages? A tech stock columnist at the capitalist tool Forbes had a bold idea: Colleges should dump their humanities departments altogether. They're just making graduates "unemployable." In fact, the columnist — and Shumlin — don't quite get the job market right. Vermont may be on the upswing, with the arrival of chipmaker GlobalFoundries and AnC Bio, the biotech facility under construction in Newport. But the Washington Post predicts a long-term trend toward firing, not hiring, in U.S. high tech; job cuts rose 77 percent in 2014. Forbes noted that while companies such as Apple "are thriving, growing and hiring," layoffs are "now a permanent feature" of the sector. Moreover, liberal arts graduates are not doomed to life behind the espresso machine. An analysis of U.S. Census data published recently by the Association of American Colleges & Universities (AACU) and the National Center for Higher Education Management Systems found that people with liberal arts degrees did better right out of college than STEM grads. They out-earned students who followed undergraduate pre-professional and professional courses such as nursing or business, and enjoyed low rates of joblessness throughout their careers. Gov. Shumlin was an English major. And President Obama started his undergraduate studies at Occidental, a teeny Los Angeles liberal arts college, before earning a political science degree at Columbia University. "Barack wasn't thinking about becoming President at college," his roommate at both places wrote. "He wanted to be a writer." But he did become president. Dumping the humanities is not part of UVM's strategic plan. But its values are moving in that direction. So, like Provost Rosowsky, let us imagine: What would happen if the humanities disappeared? Vermont might continue to be blessed with new car-selling platforms and services like MyWebGrocer, whose gift to humankind is helping "the nation's leading grocery retailers and CPG brands to build connections, drive loyalty, increase basket size and attract new customers." But we'd soon be short of teachers, lawyers, judges and magistrates, chief executives and legislators, social workers and clergy — all among the top 15 professions that arts, humanities and social science graduates pursue. The human services would be starved for personnel: Fifty percent of such workers graduated with humanities degrees, versus 5 percent with STEM degrees, according to the AACU. Already the ideology that puts money before everything else is decimating what might be called the caring economy. In fact, the Vermont Department of Labor projects growth in caregiving jobs will outpace those in tech — but these are money losers, alas, requiring taxes to subsidize them. Who would fight for human services? Plastics engineers? As the humanities languished, commercial science and technology would sally forward with waning oversight. After all, it is usually philosophers, not biologists, who challenge the ethics of tinkering with the human genome. And while engineers and physicists devise better ways to kill, artists, diplomats and ministers search for alternatives to war. For democracy's sake, please save the history departments. Don't get me wrong. We want computers, bridges and medicine. And plenty of scientists have deep humanist values. But a technocracy unchecked by humanitarian learning is a dangerous thing. Science and technology need a human voice — and I don't mean Siri's.